I took these pictures towards the end of February, but on the last few days I did do a boots haul (there was a 3 for 2 offer I just could not resist). 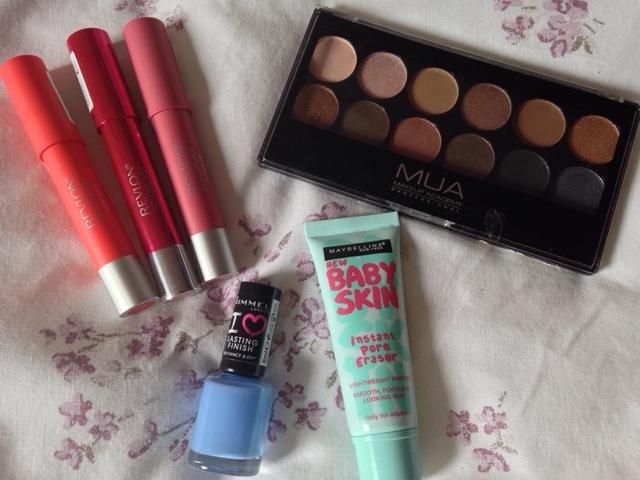 So I did technically buy a few more bits and bobs, but I will have to keep that for the next beauty haul post. As you can see this is just a small beauty haul, I've been trying to restrict myself from buying more products and use up ones I already have. 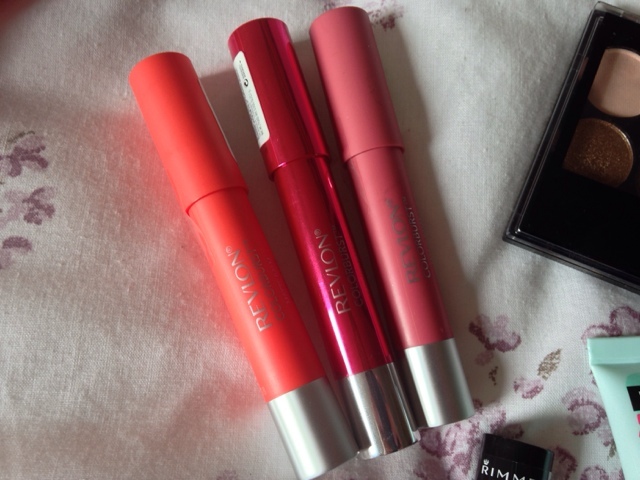 So first you can see that I've got into the beauty blogger craze and went and purchased the Revlon colorburst balms. There was so much hype for this in January and I just wasn't sure whether I'd like it or not because of its jumbo pencil-like shape. But I swatched it on my hand in boots and I really liked the texture of it so I thought why not. Again, this was 3 for 2, and with each selling for £7.99 I had to get 3! I preferred the matte balms but the boots near my uni (where I got it from) isn't really big and they didn't have all the shades, so I ended up getting one of the lacquer balms too. I bought Audacious, Elusive and Vivacious (in the order of the pictures). I may do a post with swatches of these soon and I'll give a full review on it too. The rimmel 'I love lasting finish' nail polish was something I bought after purchasing the two from my previous beauty haul thinking that they're really great and good value at £2.99. But, I noticed that they don't actually last long, which is such a shame because this colour, fancy a dip? (yes the question mark is in the name..) is beautiful. A bit late on the pastel nail trend, but hey, better late than never. 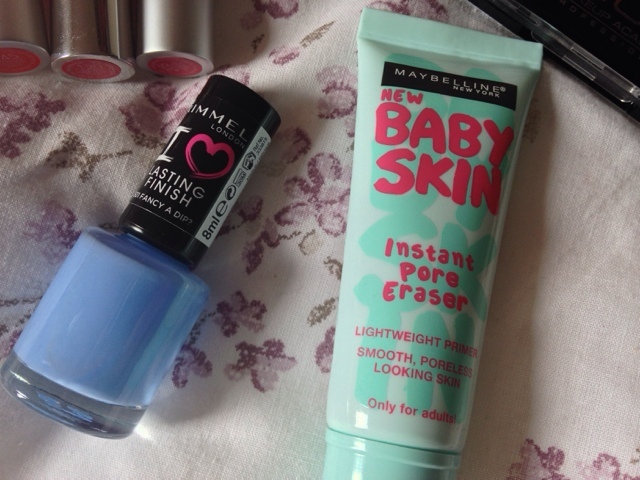 Another craze that hit the drugstores this year is the Maybelline baby skin instant pore eraser for £7.99. I haven't actually used this a lot, despite buying it towards the beginning of the month. I tested it on my hand and I really did see a great difference but I haven't really tried it properly on my face. It's kind of a forgotten product already but I will definitely give it a shot over the next few weeks and will let you know if it is as good as everyone says. 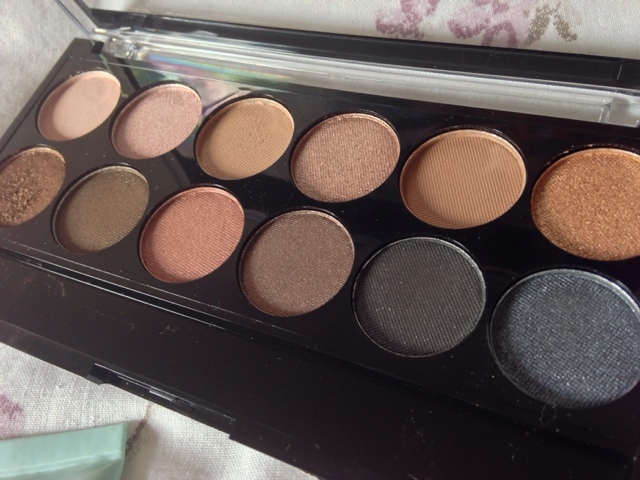 Last, but not least, is the MUA palette in undressed. I hear about the urban decay naked palette all the time on youtube and beauty blogs, and as beautiful as it looks, I cannot justify the price of it. So I searched for a good dupe and I saw countless blogs talking about the undressed palette. I reckon MUA may have purposely created this palette as a dupe, given by the name of it. But oh my, I love it! I am a huge fan of MUA's eyeshadows, I use their heaven and earth palette on a daily basis and knew that this would be £4 well spent! From pictures, the colours look identical to the naked palette and they're amazingly pigmented too so you really can't go wrong! There's a few colours in here which I wouldn't normally go for but I'm willing to experiment with them.. one day. So that is all for this months beauty haul. Let me know what great new items you have bought this month, or even reviews on the products I got. Have a nice day!